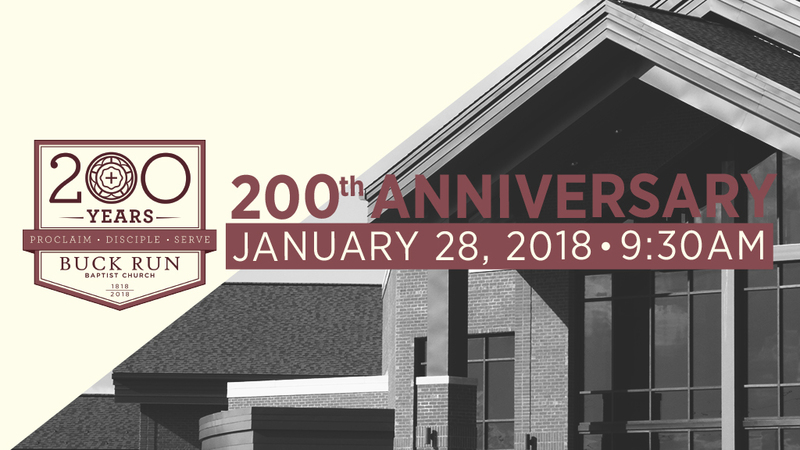 On January 28, Buck Run celebrates its 200th year as a church. Buck Run Baptist Church was founded in 1818. It all began with 21 charter members at a house on the Scott County-Franklin County line near Buck Run Creek. The small congregation maintained humble beginning as it didn’t have a permanent structure until 1848 or full-time pastor until 1919. Much has changed since Buck Run’s early years but the commitment to proclaim the gospel for God’s glory has remained the same. Today Buck Run continues our commitment to glorifying God by proclaiming Jesus Christ in order to make disciples who serve their community and spread the gospel to the nations. We proclaim because we have been born again by the grace of God. We want to proclaim the gospel in Frankfort and around the world. We disciple each other because the gospel changes us from the inside out and we intentionally minister in order to produce Christian character. We serve because we have received grace and we want to graciously serve those around us. Next Sunday we will joyfully gather at 9:30 am to remember 200 years of God’s faithfulness at Buck Run. We will hear from pastor H.B. Charles and celebrate the ministry at Buck Run. We ask that you join us in person and in prayer as we, not only remember the past but commit our future to proclaiming Jesus for the glory of God. Join us at 9:00 am for a light breakfast, time of fellowship, and a video message from Southern Baptist leaders.